Border Collie. Wise, Agile, Dedicated And Non Stop Energy. Are You Ready For The Border Collie? The Border Collie, or sometimes referred to as a sheep dog, was created over time when it became clear that dogs were used by man to hunt and protect flocks. The exact origins of this breed is often subject to speculation. However. It is said the Border Collie is descended from the Persian Sheepdog. The Border Collie is part of the herding dog breed type, and originated in the border countries of Scotland and England. "The Border collie sheep dog is widely regarded as one of the most intelligent of all dog breeds". It became clear then that a breed of dog, such as the border collie, who was reliable to protect and drive these flocks without harming them was a primary concern. Of all the breeds, sheepdogs are known for their trainability and intelligence who willingly wants to protect their masters flocks, not savage a flock as a wild dog would do. They love nothing better than to respond to their masters bidding. Border Collie And The Romans. How The Sheep Dog Began Its Rein! It has been said the Romans introduced the craft of tending sheep to the British Isles. Over time Celtic clans started to create their own varieties of sheepdogs to work their flocks. Eventually, dogs became associated with their regions Highland Collies, Welsh Sheepdogs, Northern Sheepdogs, Scotch Collies and so this went on. The Border Collie grew throughout the British Isles. 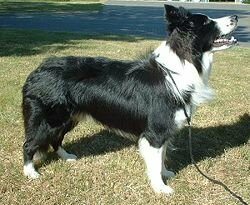 There is evidence of it's Scottish heritage with the dialect word "collie" this was used to describe these dogs. The second dog show ever to take place in England was held at the Birmingham Dog Society these were classes in 1860 offered to Scotch Sheep dogs. A short time later it was Queen Victoria, while on a trip to Balmoral, who saw her first Collie and almost at once became an enthusiast of the breed. This was the point of divergence between our modern Collie and the more traditional shepherd's dog began. "The Border Collie has remained a loyal companion and great working animal; there is hardly any change from the original dog". Whilst the function of the Collie is that of the working dog breed, they have, in recent years becoming more and more popular as family pets. However, Border Collies are inappropriate pets if the owner is unable to spend a significant amount of quality time with this intelligent breed. They require a daily exercise allowing for both physical and menta stimulationl. They are likewise a bad option for families that are not set up for the typical behaviours that are component of their working heritage. They seldom feel the need to relax when outdoors, and will constantly want to be doing something constructive as much as possible. to a gentleman by the name of Mr. R.J. Lloyd. He gave a demonstration at Alexandra Palace in London where he brought one hundred wild Welsh sheep. The sheep were kept in a remote corner of the park. Three were picked out of the flock and were carried to a hill far away and released. The sheepdogs then had to guide the sheep into a small pen in the middle of the park. The spectators sat in astonishment at the intelligence of these dogs, who responded well from hand signals and whistles from their masters. This is the ability which breeders of Border Collies wish to retain today. On October 1, 1995, the Border Collie was given full recognition status and given Herding Group designation. This breed is known worldwide as the premier sheepherding dog. The Border Collie is of medium size, well balanced with an athletic appearance, style and agility in equal measure with strength and soundness. The way it gracefully moves without effort in it's muscular body gives of the impression that nothing is an effort. The Border Collie is highly intelligent and it is fair to say that if you choose this breed, boredom is something that drives the Collie mad. That does not mean that you have to dash out and buy a flock of sheep; quite the opposite. They love agility classes and a lot of the dogs you may have seen at shows or on television dancing to music never take their eye off their master. Male And Female Border Collies Differ Slightly In Height. For the males, height at the withers varies from 19 inches to 22 inches with the females height at 18 inches to 21 inches. Border collies should have strong bones, medium being correct but lighter is preferred. Dogs should be presented in hard working condition, not mistaking excess body weight for muscle or substance. The coat of the dog can vary. There is the rough coat, which is medium in length but not excessive. The haunches, forelegs, chest and underside are feathered while the ears, face, feet and front of the legs is short and smooth. The smooth coat is short all over with a coarser texture opposite to the rough variety, slight feathering may be on forelegs, haunches, chest and ruff. 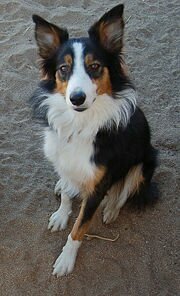 The collie dog has many colors from a straight color, bi-color, tri-color, sable and merle, a few white patches is ok but should not predominate. Overall, the Border Collie is very intelligent and loves to please its owner. The collie is friendly and will always stand its ground if confronted. When looking at a litter of pups, as with any breed, it is also nice to see the parents if allowed. This can often give some idea of the temperament. Border Collies are an intelligent breed of dog with an natural desire to work closely and intensely with a human handler. They are a considerably well behaved companion dog, as long as you have the time and energy to train your dog correctly. Do you want more in depth professional advice? SitStayFetch Is The No. 1 Dog Training And Behavior website On The Net. Over 62,043 dog owners worldwide have been successful with their dog training, and solved their dog’s behavior problems. An early start to dog obedience and agility training will make for a fantastic relationship, one that will bring years of enjoyment.